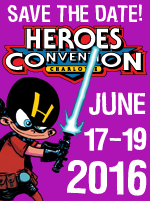 Matt aka Starneslord got a chance to catch up with our friend Shelton Drum to talk about HeroesCon, coming up this weekend (June 16-18) here in Charlotte, NC. HeroesCon 2017 will be held on June 16-18, 2017! Get your tickets for the America’s Favorite COMIC Convention today! For the most up-to-date information, check them out online. ← Episode 153: News & Views with a Shakespearean Flourish!